Why do you think Arctic science, research, and monitoring are important? The National Marine Fisheries Service (NMFS) is responsible for the stewardship of the nation’s ocean resources and their habitat. We provide vital services for the nation: productive and sustainable fisheries, safe sources of seafood, the recovery and conservation of protected resources, and healthy ecosystems—all backed by sound science and an ecosystem-based approach to management. We at NMFS need to pay close attention to the developments and changes occurring in the Arctic region because with the changes to sea ice, there is an increased interest in expanding human activities in the region (e.g., fishing, tourism, shipping). We need to consider the potential impacts of these activities on our trust resources and also conduct analyses under the Marine Mammal Protection Act, Endangered Species Act, Magnuson-Stevens Act, and National Environmental Policy Act for actions seeking authorizations and consultations for the take of marine mammals and impacts to essential fish habitat. As ocean temperatures shift, we are seeing the expansion of more temperate species distributions into the far north. We need to understand what this means for polar species, as it will likely lead to competition for prey and other concerns. It also means that fish species of commercial interest could move farther north. Currently, the U.S. has a moratorium on commercial fishing in the U.S. Northern Bering, Beaufort and Chukchi Seas. Therefore, it is important for us to understand species distributions and abundances in the region before making any determinations about whether to allow commercial fishing in the region. Even in the Southeastern Bering Sea, part of the U.S. Arctic and home to the largest commercial fishery in the U.S., it is clear that changing ocean conditions will affect the fishery. Warming waters and reduced sea ice cover will likely reduce the abundance of walleye pollock. This then will lead to significant economic impacts for coastal Alaska and the nation. What makes NOAA’s Arctic mission unique? I believe it is NOAA’s mission as the national steward for marine species that makes us unique when it comes to performing our responsibilities in any location, including the Arctic. We have a mandate to work with Alaska Native communities that rely on marine mammals for their food and culture. Co-management promotes full and equal participation by Alaska Natives in decisions affecting the subsistence management of marine mammals (to the maximum extent allowed by law) as a tool for conserving marine mammal populations in Alaska. Again, our mission of science and stewardship also makes us unique regarding commercial fisheries. Alaska commercial fisheries help to feed the nation. They land annually 40% of all commercially harvested fish in U.S. waters. Because of this, groundfish Alaska fisheries are the largest U.S. fishery by landings, and are Alaska’s largest private sector employer. Our mix of science and stewardship to continue to provide this vital service to the nation makes us unique. What are the biggest challenges facing the Arctic and how can NOAA respond to them over the next decade? In my opinion, one of the biggest challenges we face in the Arctic is the issue of food security. As ice patterns continue to shift and ocean temperatures continue to rise, there is the potential for Alaska Native communities to experience food disasters. Moreover, Alaska is crucial to providing seafood to our nation. If changes in the Arctic impact availability of commercial stocks, there will be a major shift in how the nation consumes seafood. Therefore, it is vital for us to continue to conduct the needed science, research, and monitoring to understand how changes in climate are affecting our living marine resources and the implications to food security both in Alaska and throughout the U.S.
Do you have any personal stories to share about the Arctic? 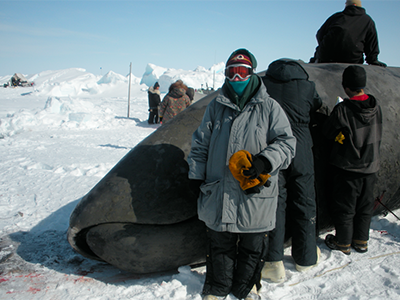 In May 2010, I was fortunate enough to spend 10 days in Barrow to assist the North Slope Borough (NSB) Department of Wildlife Management (DWM) with the bowhead whale census. At this time, the whaling captains and their crews were out scouting whales for the spring bowhead whale hunt. A day or two after I arrived, a crew landed a whale. I headed out to the ice edge with some NSB DWM biologists to take measurements and samples for further study. No matter how many stories I had heard about the cultural significance of the bowhead whale hunt to the people of the North Slope, nothing could compare to watching this all unfold in person. When we arrived, the whaling crew and a few community members were out on the ice. The long, arduous process of getting the whale out of the water and onto the ice began. As the hours ticked by, more and more community members arrived on their snow machines (Alaskan for snow mobiles) to aid in the efforts. The whaling captain’s smile went from ear to ear. He was proud to provide for his family, his crew, and his community. 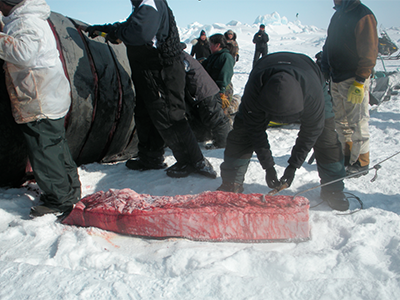 Anyone who helps bring the whale up on the ice and with the carving receives some of the meat. After spending years implementing portions of the Marine Mammal Protection Act to help protect Alaska Native marine mammal subsistence hunts, it was incredible to see the practice (passed down from generation to generation) with my own eyes. It is something I will never forget my whole life. Below are some of the photographs I took during this seven hour adventure. Learn more about Eileen Sobeck here.